A long time ago, in a galaxy far, far away where generically styled bathrobes ruled with an iron fist, a small group of fashionable rebels in pursuit of bathrobe supremacy won their first victory against the poorly styled After-Shower Empire. The reason behind their victory? 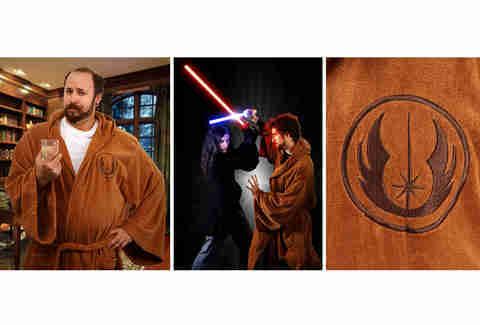 These officially licensed Star Wars Bathrobes. 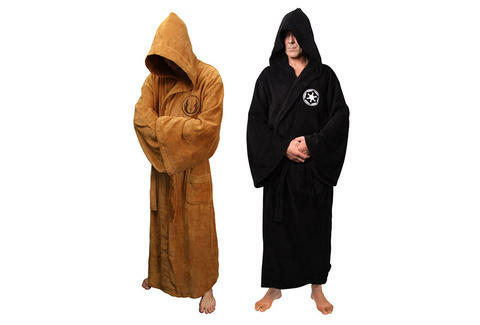 With comfort in mind, these bathrobes are made from 100 percent cotton terry-cloth and are fashioned after the hooded robes worn by the legendary Jedi knights and their counter-parts, the Dark Side-loving Sith lords. Put one of these on and you are sure to feel at one with the Force*. *Light Saber and R2 Unit not included.